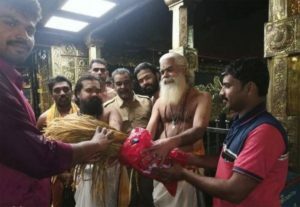 In August last year, when all routes to the Sabarimala temple were inundated and the River Pampa was overflowing, there were fears that the Niraputhari ceremony would not take place. In this context, two Christian youths Binu and Joby Jose both JCB drivers volunteered to swim across the river in spate with puthari (paddy spikes) to the temple for the ceremony. It was quite a daring act fraught with danger which was appreciated widely by the devotees. The floodwaters of Pampa had wreaked havoc and almost all buildings, bridges, roads and other establishments on the riverbank were destroyed. Even the thantri could not take part in the ceremony which was officiated by the chief priest. In the niraputhari ceremony, fresh paddy spikes are taken out in a ceremonial procession to the sanctum sanctorum. Special pujas are conducted and rice flakes made of the fresh paddy are offered to the deity as naivedyam. After the pujas, paddy spikes are given to the devotees. After taking the niraputhari to the temple, they took another route to reach their houses in Mundakkayam in Idukki district. Binu’s house was completely destroyed in the flood. Alukkas Group decided to construct a new house for Binu at the cost of Rs 5 lakh as part of its corporate social responsibility.